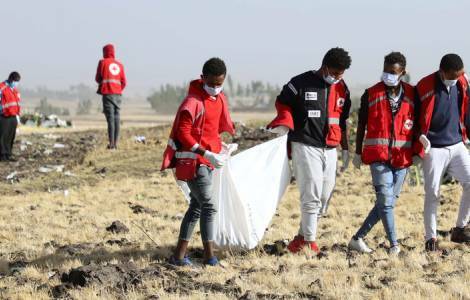 Addis Ababa (Agenzia Fides) - 157 people were killed in an Ethiopian Airlines plane crash on Sunday, 10 March, which include a priest, a religious sister, and four staff members with Catholic Relief Services (CRS). According to reports sent to Fides, Father George Kageche Mukua CMM, a member of the Congregation of Mariannhill Missionaries was a passenger on the flight. Sr. Florence Wangari, a Notre Dame de Angers Sister in her early 30s, was also on board, on her way to Nairobi. Fr. Mukua, a native of Nairobi, carried out his ministry in Rome while Sister Wangari, was a missionary in the Democratic Republic of Congo (DRC). The nun was originally from the diocese of Nakuru and was returning to Kenya to renew her passport. The four members of the CRS (Sara Chalachew, Getnet Alemayehu, Sintayehu Aymeku, and Mulusew Alemu) were traveling to Nairobi to attend a training course. 157 passengers were killed, of whom 149 came from 35 countries. These include at least 35 humanitarian operators, members of peacekeeping forces or personnel from international organizations. The crash of flight 302 has been defined by the UN "the most serious commercial plane crash that has involved the UN staff in recent decades".